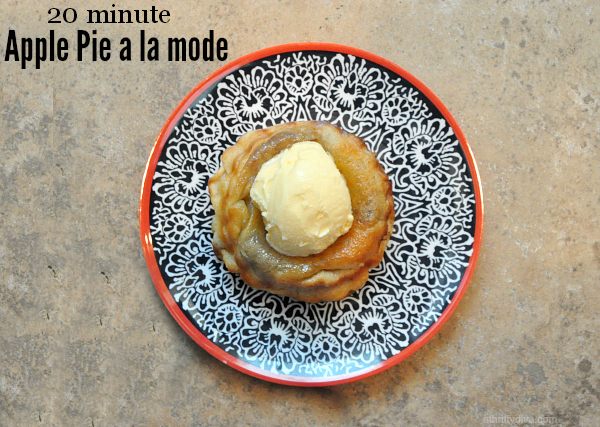 Big game day food is a sponsored post in collaboration with Babbleboxx. It’s time to start prepping and planning our big game day food. This year I am taking the pressure off myself and going with a catered option that doesn’t break the bank. Whether you are hosting a homegating party or heading to one, these big game day foods will be the talk of the party. There is no reason why we should sacrifice our weekend stuck in the kitchen pulling together party foods. I live for the easy to pull off parties. If you’re more interested in bonding over football and delicious no-fuss prep to feed your crowd this post is for you. 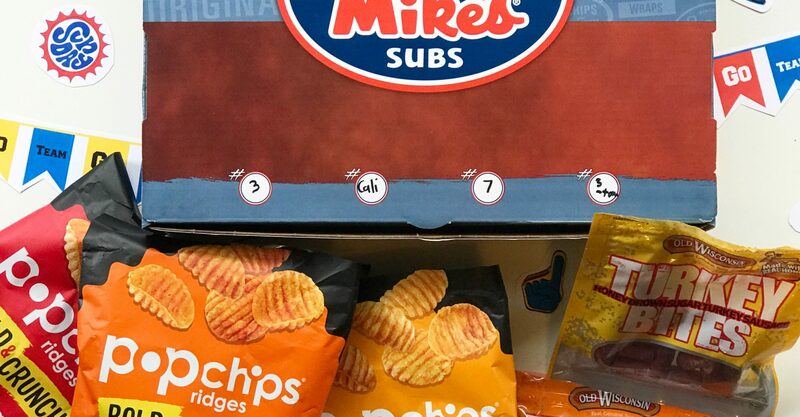 The Jersey Mike’s Catering Box is genius. Stay out of the kitchen this game day and have your food catered with cold and hot subs. The catering box is filled with four different sub sandwich options that come wrapped and cut ready to serve. The catering box pops open and makes the perfect display box. Big Game Catering is as easy as ordering your customized subs online and scheduling a pickup. I ordered this catering box while out running errands and picked it up on my way home. 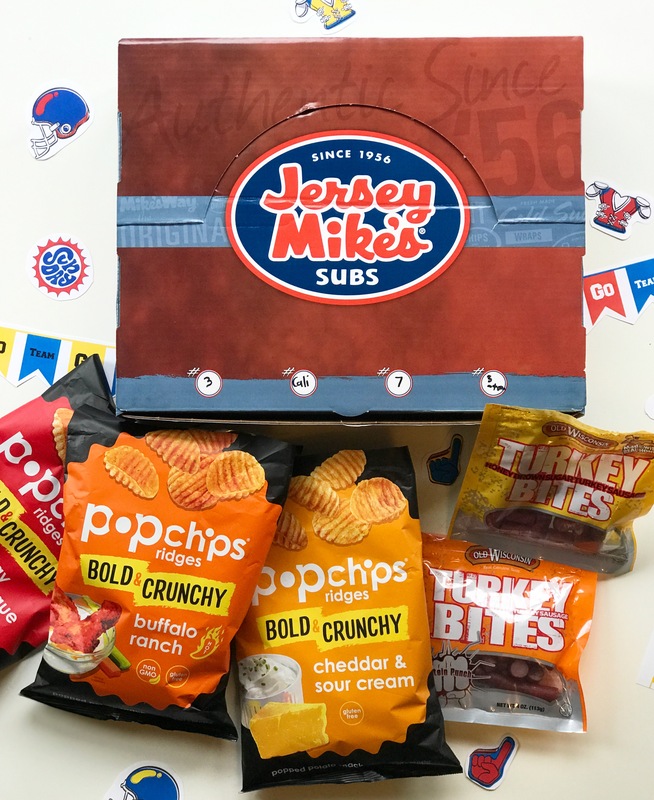 Order your own Jersey Mike’s Catering Box for the big game. 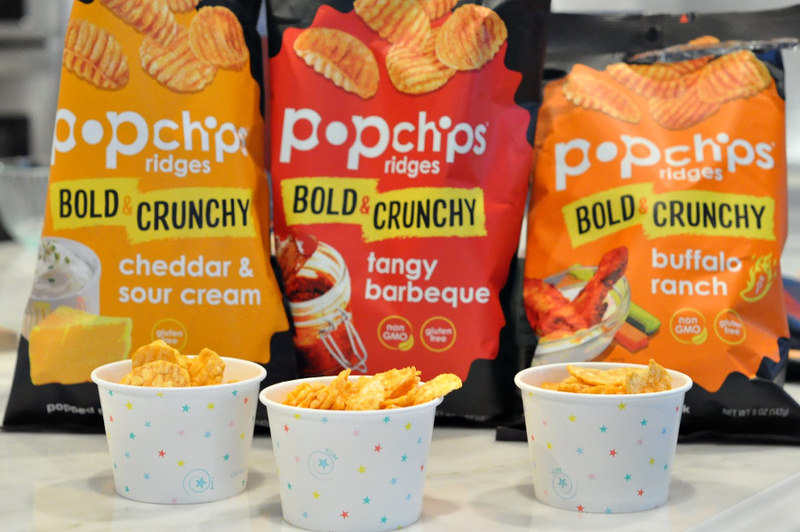 Do yourself a favor and stock up on all the popchips ridges bold & crunchy flavors for the Big Game. These snacks pack a punch of delicious flavor and will definitely keep everyone snacking. If you follow me on IG you probably know that my kids snack on popchips almost daily. As a mom who appreciates better-for-you options guilt-free chips are my jam. Swap out the deep-fried chip options and go with a variety of popchips ridges that are never fried and contain only real ingredients. At 130 calories or less per serving, these chips not only taste delicious they are prefect for anytime snacking. No need to bring the messy wings, Buffalo Ranch Ridges are just as flavorful as buffalo wings, without the mess and calories. 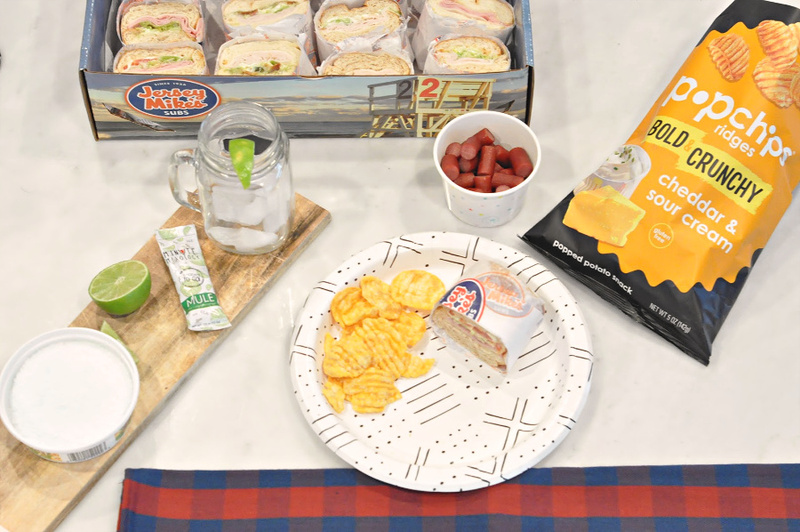 Cheddar & Sour Cream Ridges blend sharp cheddar and sour cream that we love to pair with Jersey Mike’s subs. 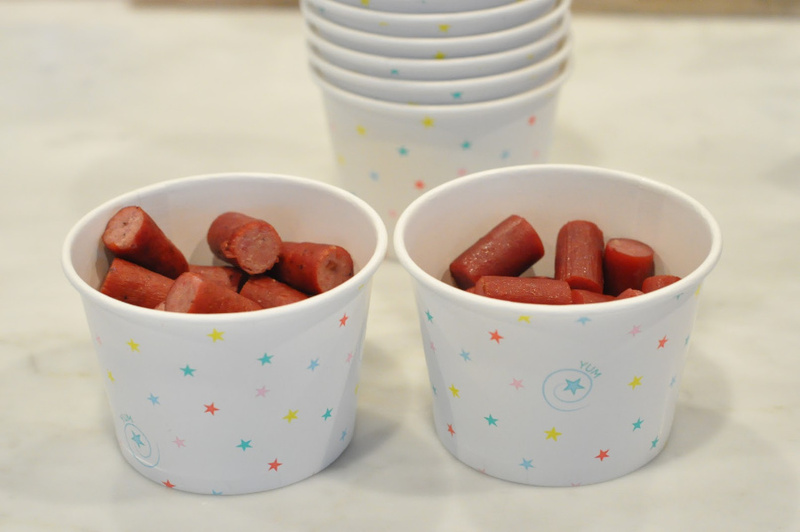 Tangy Barbeque Ridges are a personal favorite snacking option for my boys have a sweet barbeque taste that is incredibly addicting. Shop the 10 different popchips flavors at your local grocery store and at Amazon. popchips ridges are big game healthy snacks. Gameday doesn’t mean you have to forgo your 2019 plans to eat healthily. Old Wisconsin Snack Bites are healthy protein-packed snacks that have become my favorite snack to have on the go. These high-protein snacking options are perfect for anyone wanting high protein and gluten-free options. Old Wisconsin Honey Brown Sugar Turkey Bites are lean turkey snacks that taste both sweet and smoky. Old Wisconsin Turkey Snack Bites have less fat and calories with a smoky, spicy flavor. Check out Old Wisconsin for your big game snacking options. Complete your homegating party with these crowd favorites no matter who wins the big game. How do you plan on celebrating? cover itself looks so nice.taste can be feel from cover only. 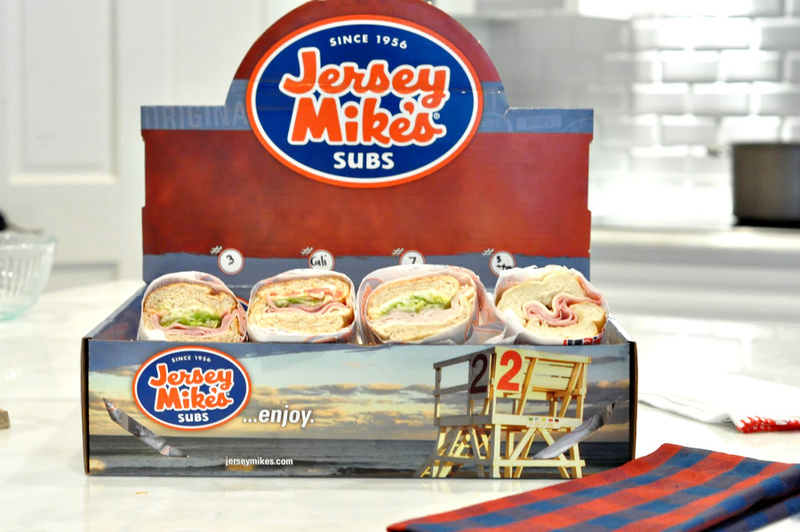 I am probably in the minority, but honestly, I have never eaten at Jersey Mike’s. The subs do look very good. Living in a very small town, our options are very limited as far as chain restaurants. Your spread looks amazing! I love PopChips, but have yet to see the ridged ones. I will have to keep an eye out for them to try soon. This is fantastic! I totally agree with taking the stress off yourself by getting something catered. This way you can enjoy good food as well as the game without slaving away in the kitchen. These are great ideas. Jersey Mike is a good way to entertain any time. I will be trying this at my next meeting with the girls.